Recently we added a subscription service for the DKW the Netherlands for Android devices! 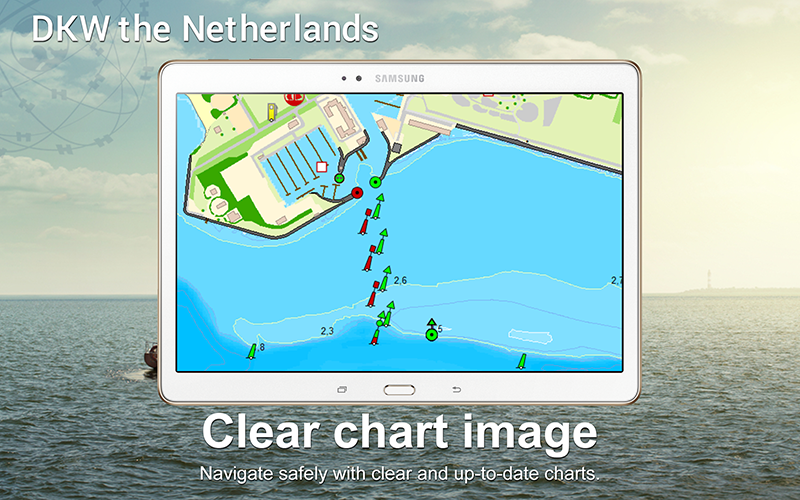 Giving you the option to navigate on the dutch water ways with a highly detailed water chart for a nominal fee. 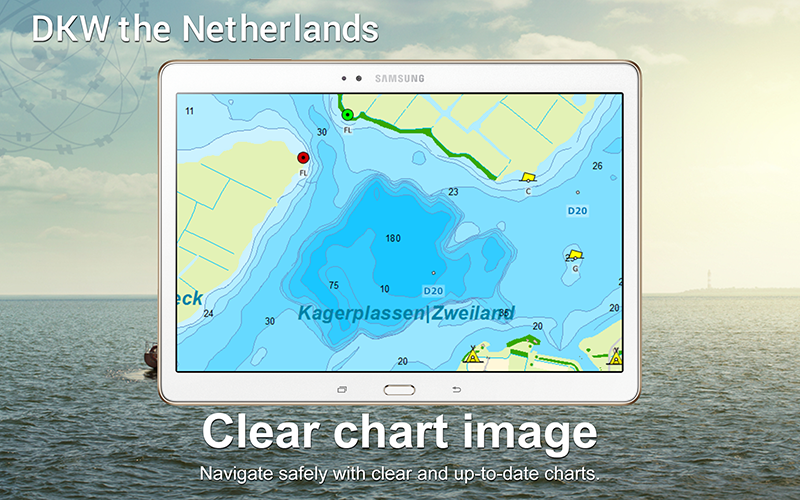 With this app you can purchase a subscription for our Dutch inland water chart and easily create simple routes. Navigating on a tablet or smartphone becomes particularly suitable for sailboats and motorboats as well as dinghies, fisherboats and canoes. For only € 15,- you can start using the DKW the Netherlands North or South for a month on an Android tablet or smartphone. With your first subscription you will receive a free 3-day trial period. Thanks to the biweekly updates, the accurate surface chart and the help of many long-time users this chart always remains up-to-date. With nearly 40.000 waypoints all information on buoys, harbours, berths, diesel filling stations, watersport campings and VHF channels can be found on the chart. 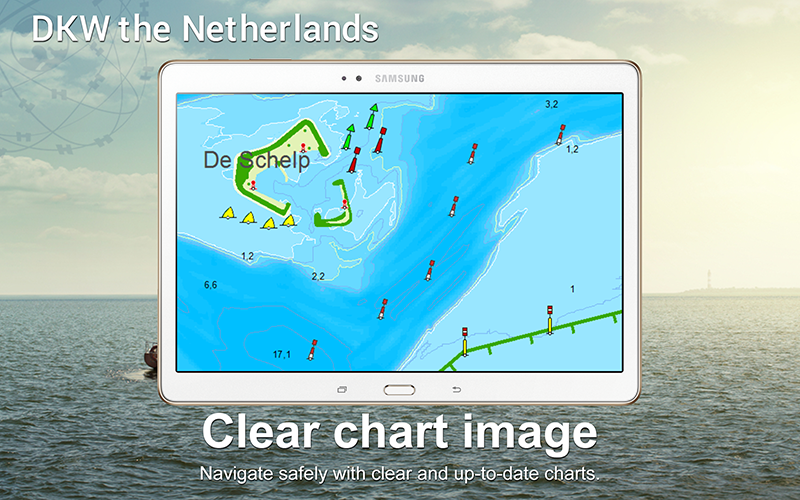 With a scale of 2 meter per pixel the chart has a large detailed view and makes it possible to zoom in up until your home port. 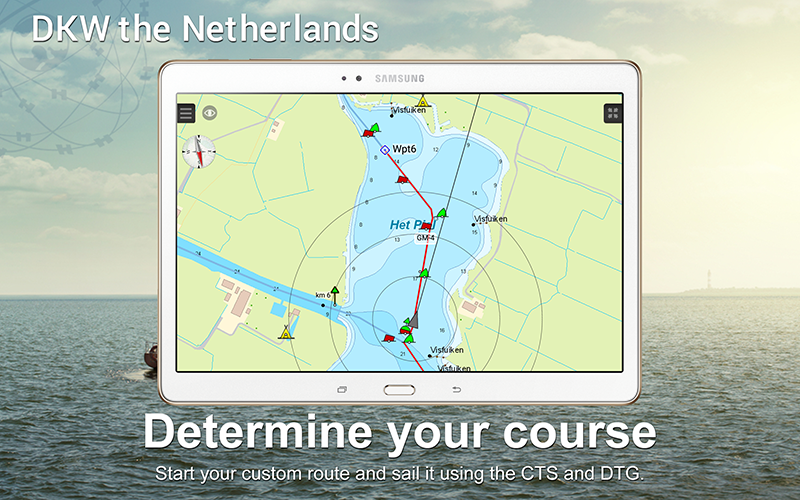 Navigation has never been this easy thanks to the DKW the Netherlands app. After downloading the chart files and turning on the (internal) GPS, you will immediately see your speed, course and position on the chart. By placing a navigational waypoint on the chart, the shortest route to this point will be plotted on the route network. Giving you information about the total distance to your destination and estimated time of arrival when maintaining your current speed. Discover how simple mobile navigation can be! Please mind: when plotting a route in the app measurements for bridges, locks and waterways are not taken into account. Our Android app WinGPS Marine does take these measurements into account. Click here for more info on WinGPS Marine. Payment is done via Google Play and subscriptions are extended automatically. When you cancel your subscription you will continue to have access to the charts up until the end of your last subscription period. For more information on Google Play subscriptions click here. With a subscription you are able to view the chart in the 'DKW the Netherlands' app. When you want more functionalities or want to use the chart set on your Windows system as well, you can order a full license in our online shop. The chart set can then be used in WinGPS Marine (Android) or WinGPS 5 (Windows). Important note: Your subscription will not be automatically cancelled when you delete the app from your device. You need to cancel your subscription manually. When you remove the app without cancelling your subscription, payments will still continue. Follow this link for more information on cancelling subscriptions. 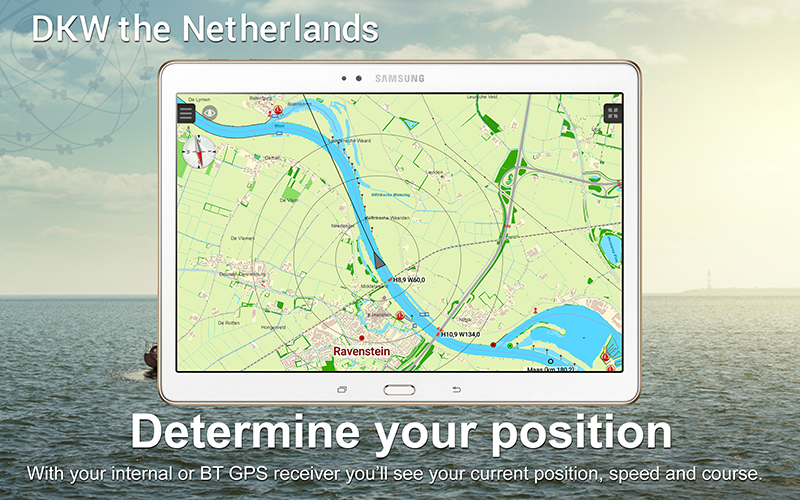 For only € 15,- you can use the DKW the Netherlands North or South on an Android tablet of smartphone for a month. After the DKW the Netherlands other well-known Stentec chart sets will be added to the subscription service, among which the DKW1800 series with weekly BaZ updates. 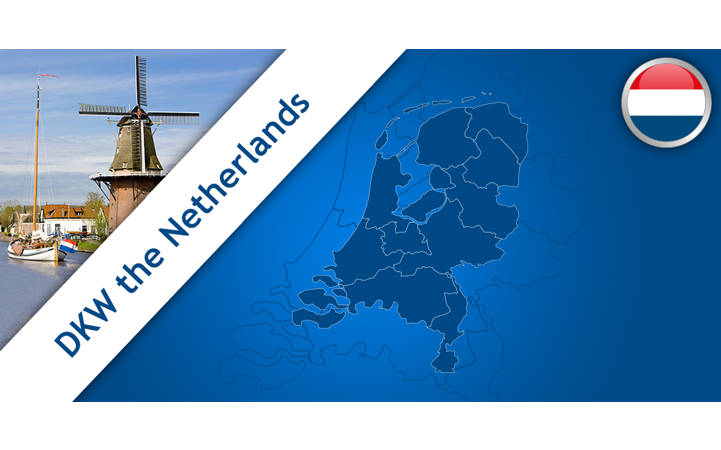 To go to the ‘DKW the Netherlands’ app in Google Play click here. If this didn't answer your question please contact our helpdesk. Are there subscriptions for other chart sets? At this moment we only offer subscriptions for DKW the Netherlands north and south. We expect to add several other chart sets to the subscriptions in future updates of the app, such as the DKW 1800 series. Can I use the subscription in combination with WinGPS Marine? No, this is not possible. The subscriptions are only offered in this specific app. Subscriptions are linked to your Google account, not any specific device. When you start using a new or extra Android device you can install the app on the system. This will grant you immediate access to the app and all functionalities. When you are unable to use the app, please make sure you have entered the correct Google account in your Google Play app. Payment is done within the Google Play app. Payments can be done with Credit Card, Paypal or Google Play coupons. How do I use the free trial period? With your first subscription you will receive a free 3-day trial period. The trial can be activated by starting a subscription. At the end of the trial period the subscription fee will automatically be debited. If you don't want to use the app after the trial period you need to cancel your subscription before the end of the 3 day period. More information on cancelling your subscription can be found here. Why do I need to select a payment form and enter my personal details? When starting a subscription all your personal data needs to be entered. When entering your data you automatically agree to automatically debit the monthly fee after the 3 day trial period. For more information on cancelling your subscription visit this link. Important note: Your subscription will not be automatically cancelled when you delete the app from your device. You need to cancel your subscription manually. When you remove the app without cancelling your subscription, payments will still continue.